, a French poet, was born in 1567, at St. Just de Lussac, near Brouage in Saintongue. He was a gentleman by birth, and his breeding was suitable to it. Alter a foundation of grammarlearning, he finished his studies at Bourdeaux; and having gone through most of the liberal sciences, under the best masters of his time, he betook himself to Paris, in the view of making the most of his parts; for, being the cadet of a fourth marriage by his father, his patrimonial finances were a little short. 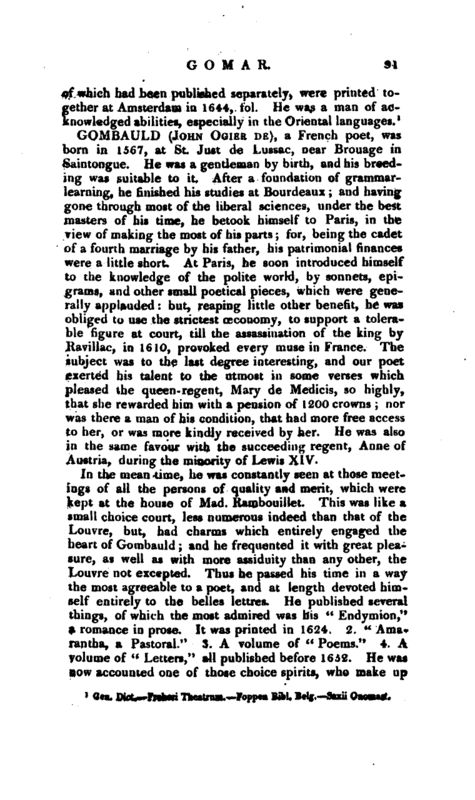 At Paris, he soon introduced himself to the knowledge of the polite world, by sonnets, epigrams, and other small poetical pieces, which were generally applauded: but, reaping little other benefit, he was obliged to use the strictest oeconomy, to support a tolerable figure at court, till the assassination of the king by Ravillac, in 1610, provoked every muse in France. The subject was to the last degree interesting, and our poet exerted his talent to the utmost in some verses which pleased the queen- regent, Mary de Medicis, so highly, that she rewarded him with a pension of 1200 crowns nor was there a man of his condition, that had more free access to her, or was more kindly received by her. He was also in the same favour with the succeeding regent, Anne of Austria, during the minority of Lewis XIV. In the mean time, he was constantly seen at those meetings of all the persons of quality and merit, which were kept at the house of Mad. Rambouillet. This was like a small choice court, less numerous indeed than that of the Louvre, but, had charms which entirely engaged the heart of Gombauld; and he frequented it with great pleasure, as well as with more assiduity than any other, the Louvre not excepted. Thus he passed his time in a way the most agreeable to a poet, and at length devoted himself entirely to the belles lettres. 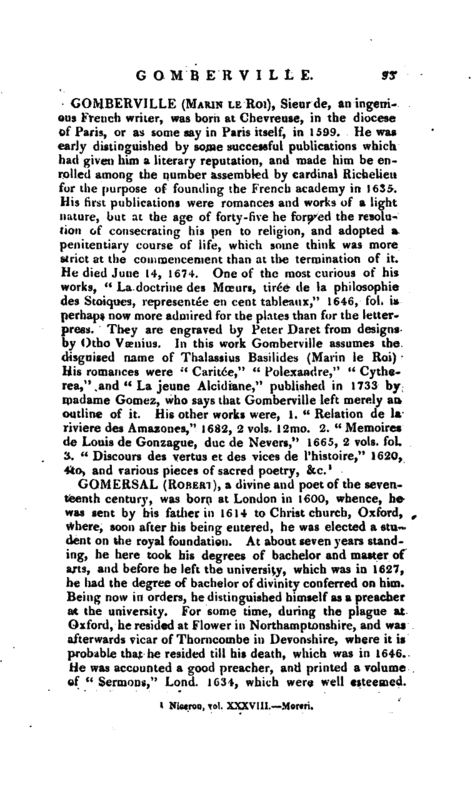 He published several things, of which the most admired was his “Endymion,” a romance in prose. It was printed in 1624. 2. “Amarantha, a Pastoral.” 3. A volume of “Poems.” 4. A volume of “Letters,” all published before 1652. He was now accounted one of those choice spirits, who make up | the ministry in the republic of letters, and form the schemes of its advancement. In this employ we find him among those few men of wit, whose meetings in 1626 gave rise to the Academy of Belles Lettres, founded by cardinal Richelieu; and, accordingly, he became a member of that society at its first institution. He was one of the three who was appointed to examine the statutes of the new academy in 1643, and he afterwards finished memoirs for completing them. 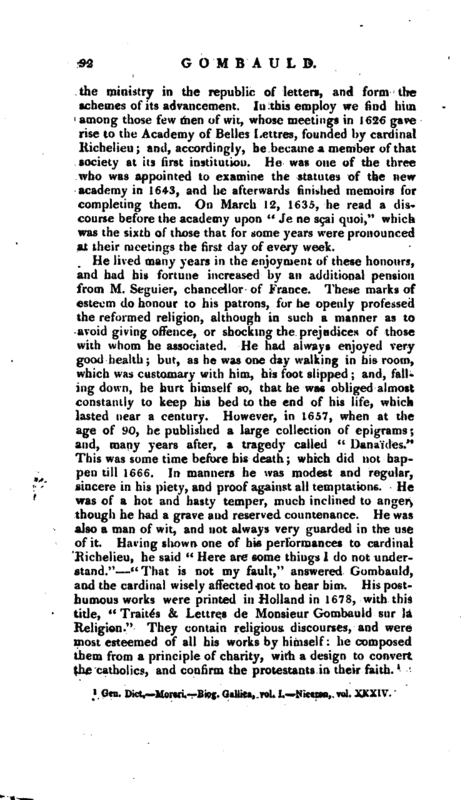 On March 12, 1635, he read a discourse before the academy upon “Je ne scai quoi,” which was the sixth of those that for some years were pronounced at their meetings the first day of every week. Gen. Dict. —Moreri, Biog, Gallica, vol. WNiceron, vol. Xxxiy.